If you’re working with a team of people within a contained area, two way radios are the most effective method of contact, both in terms of cost and convenience. As two way radios have been in existence for a number of years now, many advances have been made and radios have drastically improved. All of our two-way radio sets come complete with aerials, chargers and batteries. 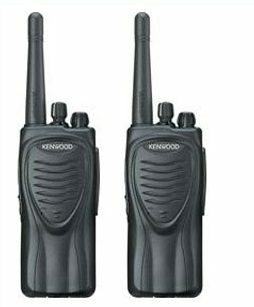 If you’d like to order a set of two way radios for your business, please get in touch. D J H Communications is happy to hire out two-way radios for the duration of your event in order to improve communication on site. This service is perfect for those in need of short-term radio hire. The two-way radios available at D J H Communications Ltd are produced by some of the leading two-way radio manufacturers. These include Kenwood, Motorola, and Hytera. Need something more than two-way radios? On top of our comprehensive selection of two-way radios, we also sell a number of other communication products. These include mobile phones, fixed line telephones, Mobile Broadband, mobile phone accessories and fleet tracking devices.